Conflict? What Kind This Time? Are you experiencing conflict @ work at the moment? What kind? How well are you aligned with your organization? Do you support the organization’s initiatives? Its values? Its mission and the specific things it does in the world? How about your job? Do the tasks you do on a daily basis align with your skills, abilities, and preferences? 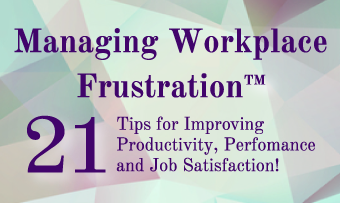 Are you having interpersonal conflict @ work? Specific people? Certain kinds of people? Almost everyone? And how about your relationship with yourself? Is that one good? Are you happy with who you are? Are you making good choices? At home and @ work? Conflict can take many forms, and each of those types of conflict can create stress @ work, keeping us from being happy and successful on a daily basis, and often overriding the meaning we might find in the work we do each day. Stay tuned…there’s more to come this week about each of these aspects of conflict. Previous Article Previous Article: Interviewing: Eye Contact, Handshakes, and Names! Next Article Next Article: Conflict with (not within) Your Organization?